The last time the Boston Red Sox and Los Angeles Angels met, both teams were hot and the three-game series in Anaheim was to provide some sort of early excitement to the long and winding baseball season. The Red Sox, who came in 13-2 against the 13-3 Angels, not only won all three games but did it by a combined count of 27-3. "Give those guys credit. They had a great series," Angels manager Mike Scioscia said after the finale, and after the Red Sox beat up on Shohei Ohtani. David Price, who won the opener of that series, faces the Angels and emergency starter John Lamb on Tuesday night in the opener of a three-game series at Fenway Park. With six starting pitchers on the disabled list, the Angels were able to get Ricky Skaggs back after the right-hander missed a game with a tight hamstring, but he had to pitch Monday's makeup game at Kansas City. That left Lamb, a left-hander with a 2-12 lifetime record and 6.12 ERA, to make his second start in the opener of the series against Boston. Missing Skaggs meant the Red Sox were able to avoid a pitcher who had won three straight starts with an 0.45 ERA (he lost 2-0 on Monday). Now, losers of 10 of its last 14, Boston gets Lamb, who allowed three runs in 3 1/3 innings replacing Skaggs last week. The Red Sox are coming off a series win over the Seattle Mariners, finishing off a 4-3 two-weekend win over the AL West contenders. They rode a 13-strikeout effort from Chris Sale to a win in the rubber game Sunday. "I'm glad that he's on my team and I don't have to face him," Boston's Mitch Moreland said of Sale (7-4). "He's filthy and showed it again today." 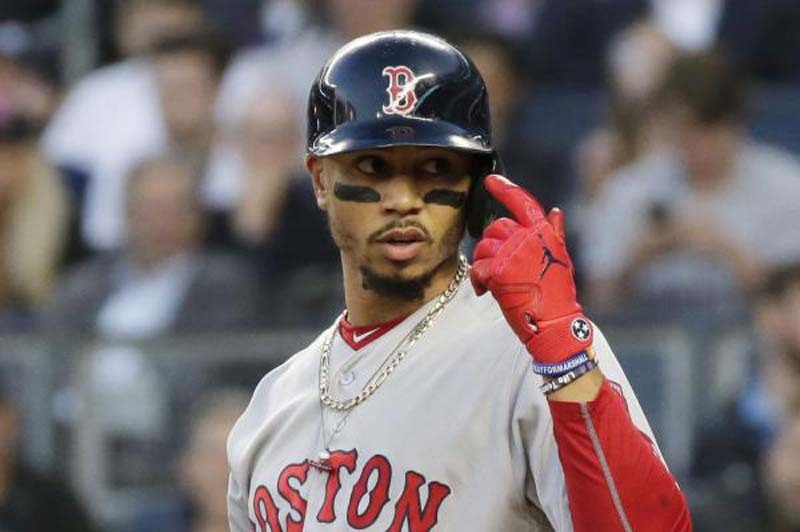 The matchup at Fenway renews the "best player in baseball" talk, with Red Sox fans pushing Mookie Betts over Mike Trout. While Betts spent time on the disabled list with an abdominal strain and missed a weekend game with illness, Trout has DHd the last six games because of a sprained right index finger. "After a week, he was going to throw and evaluate it," Scioscia said Monday. "We're kind of there now. We'll see. He's not going to play center field (Tuesday). It's how he progresses when he starts to throw." Amazingly, Trout is a .371 hitter in 16 lifetime games at Fenway, but he has never hit a home run in the old ballpark. He has driven in 11 runs and stolen six bases. Price had a six-game (seven-start) winning streak snapped his last time out, at Minnesota, but allowed just three runs in six innings and could have won with some support. Price is just 6-7 with a 3.45 ERA lifetime against the Angels. The current LA roster doesn't have much to brag about against the lefty. Albert Pujols is 10-for-31 (.323) with two homers and five RBIs, but Chris Young is 1-for-14 (.072), Luis Valbuena 1-for-8 (.125), Ian Kinsler 5-for-29 (.172) with a homer, and Trout 4-for-23 (.174) with 11 strikeouts. Lamb, with the Cincinnati Reds the past two seasons, has never faced the Red Sox. The Monday makeup allowed the Angels and Royals to celebrate the postponed April 15 Jackie Robinson Day, so all players on both teams wore No. 42 Monday. "We're all obviously very proud to do it," Scioscia said before the game. "I think it's cool. We missed it (on April 15) and the guys had been looking forward to it. They were like, 'Oh, man.' It's kind of nice because we're the only two teams doing it today. We're happy about that, for sure."